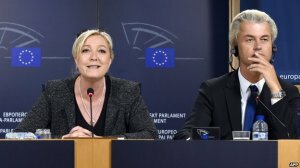 France’s far-right National Front (FN) has failed to form an alliance with the Dutch Freedom Party (PVV) of Geert Wilders, reducing both parties’ influence in the European Parliament. Pan-European party blocs get more funding, staff and speaking time in the parliament. The deadline for forming a bloc expired on Monday night. The new 751-seat assembly, elected in May, holds its first session next week. The UK Independence Party (UKIP) has formed a bloc with other Eurosceptics. UKIP’s new allies are the Italian Five Star Movement of comedian-turned-politician Beppe Grillo, Lithuania’s Order and Justice Party, the nationalist Sweden Democrats and a few anti-EU MEPs from Latvia, the Czech Republic and France. Jointly they are called the New EFD (Europe of Freedom and Democracy). Under parliament rules, a faction has to consist of at least 25 MEPs from a minimum of seven EU countries. The EU has a total of 28 member states. The FN and PVV failed to satisfy the seven-country rule. Before the election Mr Wilders and FN leader Marine Le Pen had spoken of their common ambition to return powers from the EU to the nation states. Ms Le Pen’s triumph, leading the FN to first place in the French election, gave her party 23 seats. It was one of the biggest surprises on an election night that saw big gains for anti-EU parties across Europe. In the last parliament the FN had just three seats. Mr Wilders was disappointed with the PVV’s result, however. The party won just three seats and fell to fourth place in the Netherlands – well behind liberal and centre-left, pro-EU parties. Both the FN and PVV want tougher immigration controls, reject the euro and want their countries to leave the EU. Both parties also campaign strongly against the spread of Islam in Europe. Mr Wilders said forming a faction with Poland’s Congress of the New Right would be “a bridge too far”. The Polish party has been accused of anti-Semitism and misogyny. But Mr Wilders said he still hoped for co-operation between his PVV and like-minded parties in the parliament over the next five years, including the FN, Belgium’s Vlaams Belang, the Austrian Freedom Party (FPOe) and Italy’s Northern League. Actually, he won four seats and the biggest party in the country won five. What’s more, he suffered immensely from the low turnout, and from artificial outrage kicked up by the mass media in the weeks leading up to the elections. And you should mention that the Front National is now France’s number one party, and that the far-right FPÖ is now polling distant first among under-30s in Austria.